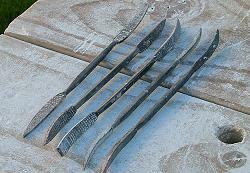 There are many types of files and rasps that can be used for shaping stone. They are a very effective tool because they can change a very messy sculpture with lots of chisel marks, gouges and bumps and transform it into having smooth lines and curves. At this point the sculpture really starts to take shape. Adjustments can then be made and the sculpture can be refined for sanding. Once you have removed the bulk of excess stone and chiselled the main shape you will need to use a coarse file or rasp and then move on to a finer tool like the riffler files. The type of rasp that I recommend is a Sure Form shaver. (Many people call it a cheese grater). I like it because it is small and easy to use; this makes it great for children to work with as well. The blade is slightly curved and makes it easy to access many parts of the sculpture. Another good feature is the snap-on blade. They are cheap and easy to replace. The handle is comfortable and you operate it in a pulling motion. There are other bigger rasps that you can buy and they will work well with large sculptures where you have plenty of room operate but they become clumsy in tight areas. 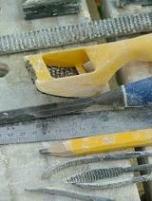 This little round rasp does a good job in most situations. The type of file that I would recommend using is the 10inch, 250mm half round wooden file. This is a great file for dealing with sculptures that have a hole drilled through it or if there is a space that is tubular and tricky to get into. It s a toothy type of a file which is great for removing excess stone and the flat side of the file is also very good for general smoothing down. Once you have shaped your sculpture you can then work on some more detailed areas with the riffler files.